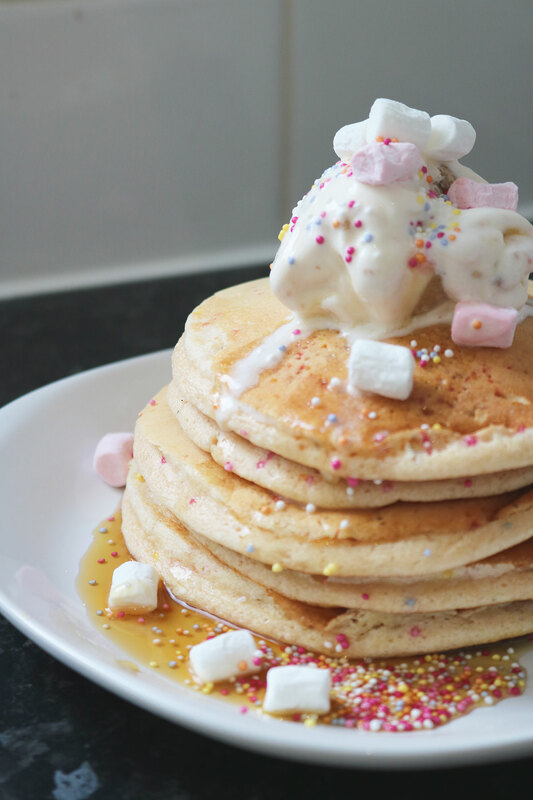 When I was a child, pancake day was all about the sprinkles. My mam would usually make them for pudding, a plate of gently steaming pancakes, a tub of vanilla ice cream, Treat! strawberry syrup and whatever sprinkles the baking cupboard yielded set in the middle of the table. My sister would usually choose Nutella to spread on hers, rolled up and eaten with one hand like a burrito, my mam probably choosing a small scoop of ice cream or perhaps butter if there was any. But I’d always pick ice cream, syrupy artificial strawberry and a cascade of sprinkles eaten with a spoon. In my teens pancake day duties would probably have been taken on by myself or my sister, gloopy drop scones that seemed to take longer than it should have to perfect. Since ‘becoming an adult’, I’ve usually marked Shrove Tuesday by making fat American buttermilk pancakes and serving with maple syrup and crispy bacon for dinner. But this year, overrun with sprinkles and determined to create something a little more colourful, I turned to funfetti. 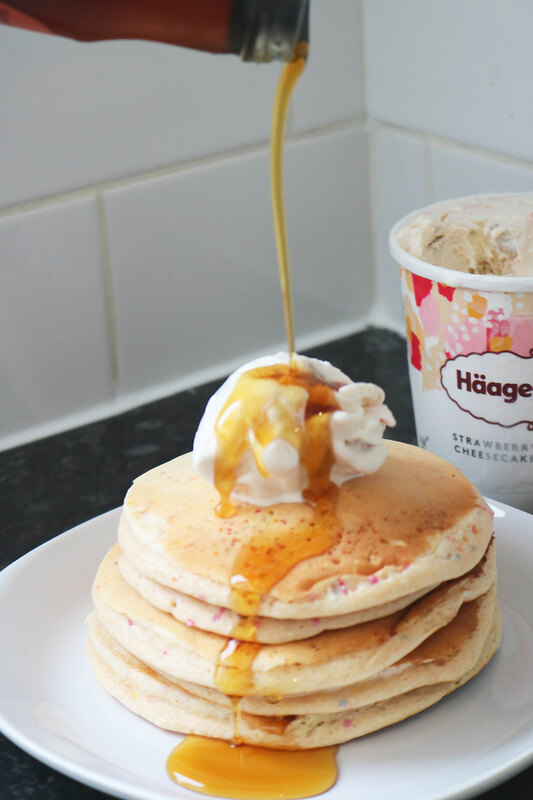 I wasn’t planning to top the pile of pancakes with strawberry cheesecake ice cream, but my inner child started a tantrum when I walked past Häagen-Dazs on offer in Asda. 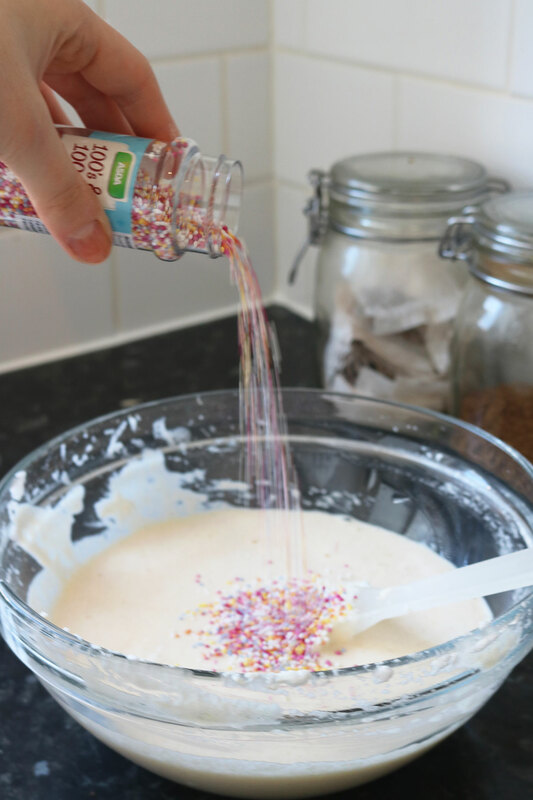 I must admit, it’s hard to make funfetti anything in the UK when the majority of our sprinkles these days are devoid from the sweet E-numbery deliciousness of artificial colours. When added to cake mixes and pancake batter, the colour bleeds into a peach and the sugary pearls disappear. 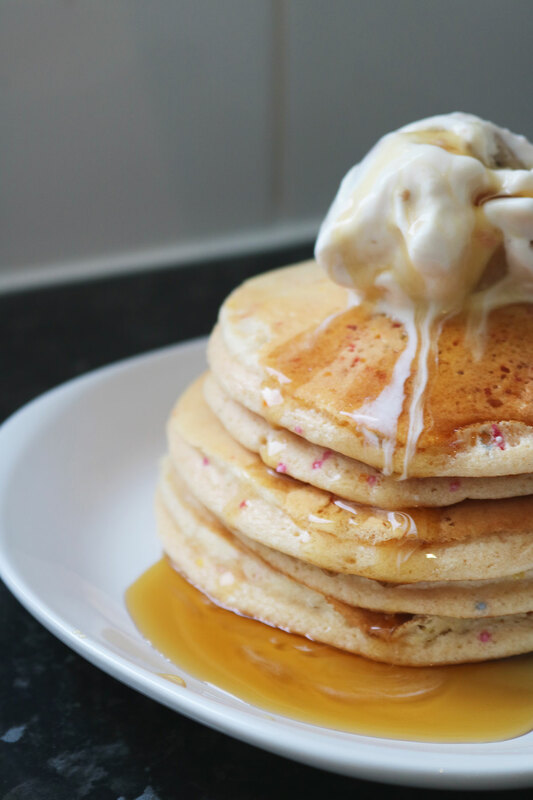 While I wholeheartedly advocate peach coloured pancakes, I’d add that unless you can get proper vivid sprinkles online or in a cake shop, just sprinkle them over the top as they bake in the pan as I did rather than stirring into the batter (as I also did). What these pancakes lack in inner colour, they make up for in fluffiness that can only come from whipping egg whites separately from the yolks and while it’s slightly faffier than a normal batter, the result is a much lighter pancake. Perfect for completely drowning in syrup, ice cream, marshmallows and sprinkles then. Some children never grow up I guess. Separate the eggs into two bowls and using an electric whisk or regular whisk, whip the egg whites to a stiff peak. In the bowl with the yolks, add the flour, baking powder and milk and whisk together to create a creamy batter. Carefully fold in the egg whites a scoop at a time, taking care not to knock too much of the air out of the batter. Add in half the hundreds and thousands at this point if you can get your hands on the seriously pigmented kind, otherwise set to the side for sprinkling. Place a frying pan over a medium heat and grease with the butter. Once the pan feels hot enough, place a ladleful of batter into the middle and sprinkle over a little of the hundreds and thousands. When the pancake begins to bubble and the bottom feels crisp, flip over and cook for a further 30 seconds to a minute then transfer to a clean tea towel or chopping board and keep warm. Repeat with the remaining batter to make around 6 to 8 large pancakes then divide between two plates. Go wild with ice cream, syrups, sprinkles, mini marshmallows or anything your heart desires. Pancakes don’t keep too well so try to eat them the same day or wrap up and heat in the microwave the next morning for breakfast. Haha thanks Kerstin, I wish I made extra for my breakfast today! These are so colorful and fun!! 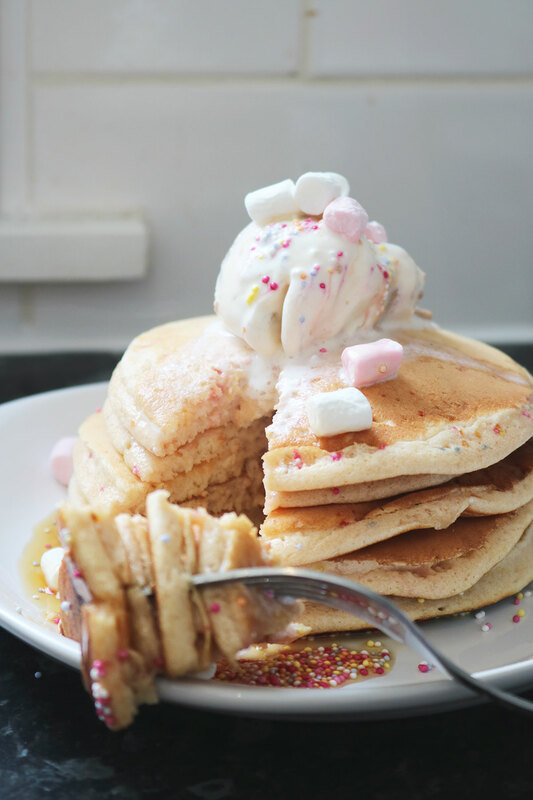 I make pancakes every Sunday so this will definitely be happening this weekend. Thanks Leigh, glad you like them! Hopefully you can find some really pigmented sprinkles to make the colours pop! Looks yummy. I am definitely going to try this. 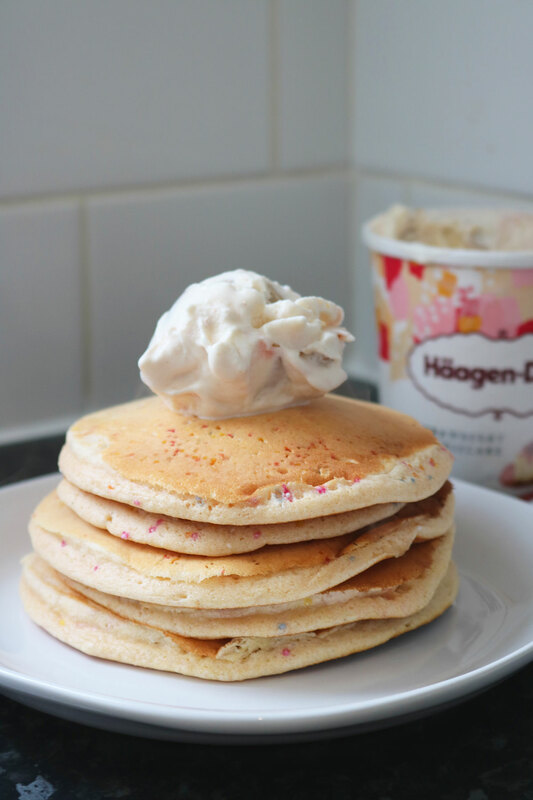 Funfetti is my absolute favorite so I love them seeing them as pancakes too! I love it too Pamela – so fun and colourful! 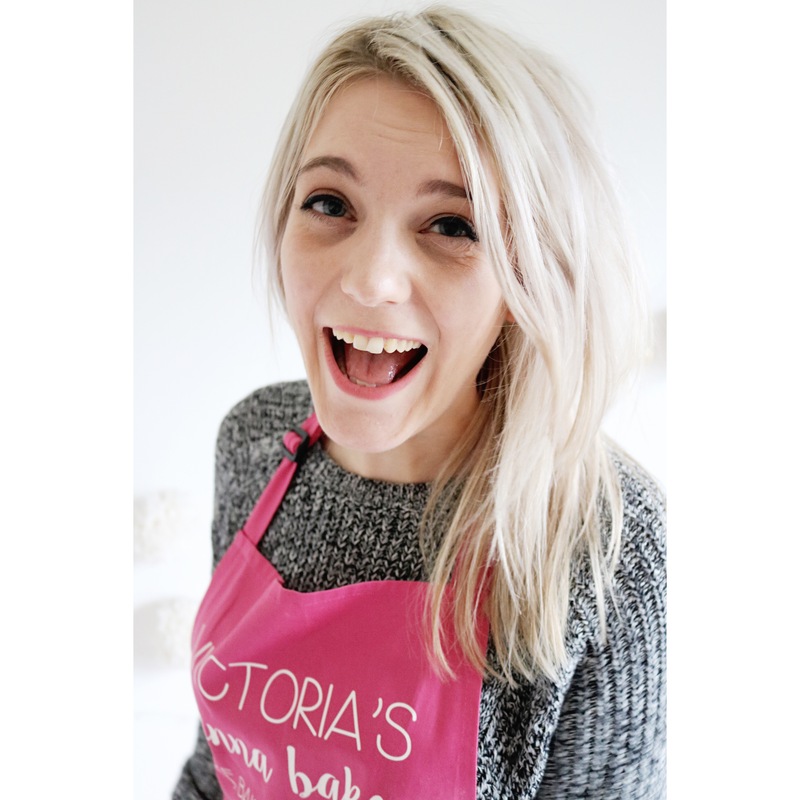 I’d love to do a collab – once we get settled into our new place I’m sure I could come up with some ideas 🙂 but pancakes are a good place to start I reckon! I am a pancake lover and I have tried over a dozen pancakes recipes. I will definitely try your recipe, Victoria! ohmygosh these look delicious. My husband would love these for his bday! Thanks Lindsay, glad you like them! 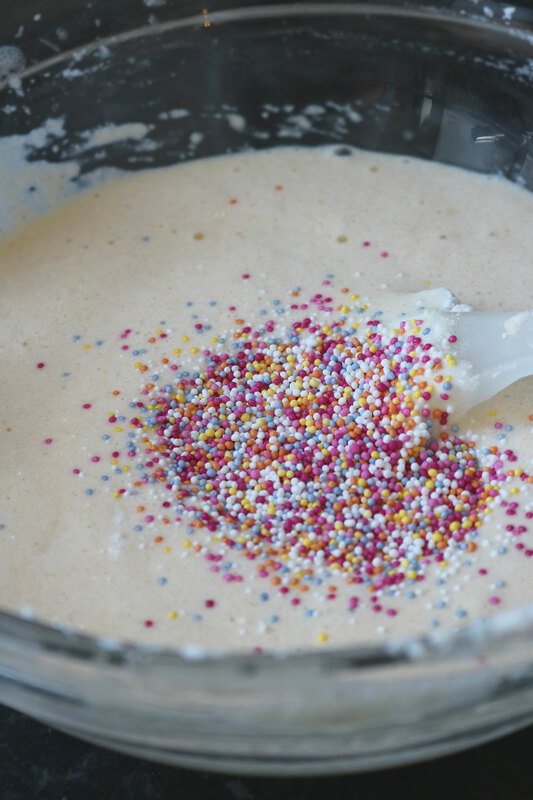 Make sure to use super bright sprinkles to make the funfetti really pop!